Please share memories and condolences as we mourn the passing of Lon Simmons (1923-2015). 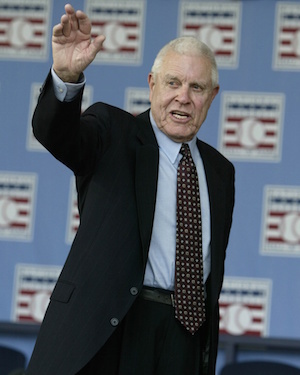 The Giants family and Bay Area sports community lost a true gentleman this morning when Hall of Fame broadcaster Lon Simmons peacefully passed away at the age of 91. The club invites fans to please share your memories and condolences in the comments below. To Giants fans everywhere, his voice was synonymous with Giants baseball for five decades. Best known for his booming baritone voice, encyclopedic sports knowledge, flair for the dramatic and self-deprecating sense of humor, Lon was the link between generations of Bay Area sports fans and their hometown teams. He was a legend among Giants fans, whose career with the team spanned five decades – beginning when he joined Russ Hodges in the broadcast booth during the team’s first season in San Francisco in 1958. Please leave your thoughts below. 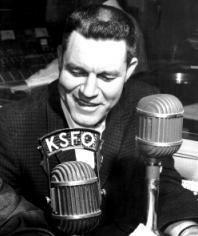 When Lon Simmons was inducted into the MLB Hall of Fame in 2004, the campus radio station at Fresno State, KFSR FM, did a 45 minute broadcast of the ceremonies, comments from Simmons himself, and highlights of his career — from his calls at the Coalinga, CA, Horned Toad Derby races to his Swivel Chair Scruncher commercial with Russ Hodges for Roos Atkins to his many home run calls during his years with the Giants. Also featured are comments from other members of the Hall of Fame, including Joe Morgan and Dennis Eckersley. The program is available on MixCloud under Lon Simmons, for those interesting in hearing him talk about his career. Like many others, I remember listening to Lon at night on my transistor radio. I lived in Yuba City and the only time we could get Giants baseball really clear on the radio, was at night. I would usually go to bed around 9:30 and for the next hour or so I’d listen to the end of the game with the radio underneath my pillow so I wouldn’t wake anybody else up. When the Giants won, I ended up staying up later to hear all of the great player interviews and commentary by Lon. My favorite non baseball call of all time though was when he called Steve Young’s incredible run against the Vikings. It was hysterical and really added to the incredible run that Steve made. He had a unique way of making the game come to life so that the players on the field became like friends because of the way Lon was able to talk about their lives. He was such a gentlemen in every sense of the word. We have certainly been blessed to have so many truly great announcers in the Bay Area and at least for me, Lon is at the top of them all. My thoughts and prayers are with his family. Thank you for allowing your dad to be such in integral part of our lives. My love of the Giants started the year they arrived here. 1958, Seals Stadium, Willie Kirkland hits one out of the stadium, and I am sold. Started a radio love shortly after, and Russ and Lon were the voices I grew up with. Home run calls extraordinaire. Lon’s wit, and delivery, especially some Spring Training gems he pulled off somehow, will always be embedded. Roll forward to 2004 and the offer came to order a Lon bobblehead, his signature call delivered with the push of the baseball button on his desk. Eleven years later, upon hearing of Lon’s passing I go into my “baseball room”, push that baseball, and presto, there is Lon making his call, and it is 1960 all over again. He will always be our legend. Think I will go push that baseball again now…. My mother, Russ Hodges and Lon frequently had cocktails in and around our apartment in Sausalito and had many a good time together. The epic stories of Russ and Lon driving together to Arizona (Casa Grande at that time) for spring training are especially fond memories. Lon, like Russ, described what was going on on the field in a way that radio listeners could visualize it (a lost art?). Unfortunately, the last time I saw Lon was at my stepfather’s (Russ Hodges) funeral in 1971. I’ll always remember the big tall guy with the booming voice. Condolences to the family – RIP Lon. My condolences to Lon Simmons’ family. I first listened to Giants’ baseball games in the early 1960’s. I learned the game of baseball listening to Lon and Russ Hodges as a kid on the radio. Also listen to Lon doing the play by play on the 49ers when the 49ers played their games at Kezar Stadium. So much fond memories of the games Lon broadcasted both Giants, A’s and 49ers’ games. Felt good listening to Lon. Thank you Lon Simmons for all the great memories. Lon’s grandson played little league baseball in Terra Linda with our oldest son, and, trust me: you haven’t lived until your son hits a home run, and you hear Lon in the stands, with that wonderful voice, call your son’s homer. Rest well, Lon. You taught us all how to love baseball, and the Giants. “We’ll then your welcome” he said and gave me a big smile. A great sports memory for me. Country singer Lionel Cartwright sings a song “I Watched it all on my Radio”. When I first heard that song I had visions of Russ and Lon calling Giants games while I laid in bed with a radio under my pillow. The play by play calls were so good I watched many games on my radio, knowing what happened just by the excited, exacting calls made by Lon and partner. To this day I can visualize the final play of 16 innings, Spaun vs Marichal and a Mays HR to win 1 to zip. Announcers like Lon truly gave fans a chance to “watch it all on their Radio”. Thanks for the memories. Condolences family and Giants fans. Like a lot of us, we grew up listening to Lon and Russ. I learned how to love the Giants and baseball while listening to both of them. Lon’s bass voice made the games so exciting! RIP Lon Simmons. You are loved and missed. I was one of the thousands of kids who listened to Lon Simmons on the transistor radio with the Chronicle green pages covering the living room floor. I raced through each week waiting for Saturdays to come again so I could listen to the magic of Lon’s voice. He taught me about baseball. I tried listening to today’s opening Met broadcast and heard Kurt Shilling and I turned the game off and shed a tear for Lon’s passing. Heartfelt memories. Lon Simmons…going to miss him. Already did when he was no longer announcing. He is part of my childhood. My Dad loved Lon Simmons and we would listen to the Giants on my Dads red transistor radio. No matter how good the Giants were or were not we were loyal to listening to Lon on the radio. Lon is gone but never forgotten! You hit the nail right on the head, Jeanie.. My dad & I would listen to the game on a transitor radio. You had to use your imagination And Lon told it just as it was. He will always be the Voice of the S.F. GIANTS BASEBALL. I grew up listening to Hank Greenwald in the 80s and always heard I’d missed out from the old timers. So when Lon called a homer during one of his stints in relief for Jon Miller during the 2002 playoff run, I knew to savor it. “Way back way back…tell it goodbye, a home run for Rich Aurilia.” Chills down my spine to have been lucky enough to have heard just one live. He was a wonderful broadcaster who always let the event speak for itself. I remember the longest game in Giants history, a 23-inning, 2nd game of a doubleheader against the Mets back in ’64. To a kid listening on his transistor radio, he sounded as good at the end as he did at the beginning. We’ve lost a true icon. I grew up listening to Lon. He is Giants baseball to me. Spent many hours listening to Lon do the Giants, A’s, and Niners. Every broadcast was entertaining. Saw Lon a few years ago at a golf course in Maui and he spent about 10 minutes with our group talking and telling stories. A great person and broadcaster who will be missed! In the spring of 1958, I discoverd Giants baseball on KNBR while recovering from pneumonia. The voices of Russ and especially Lon hooked me on baseball forever. I feel as though I have lost a family member. Say hello to McGraw, Matthewson and the boys for us, Lon. RIP Lon! Reunited with Russ ! Lon Simmons and Russ Hodges. I’m sure you’re calling games on opening day for all the baseball legends who have pased. A true FIeld of Dreams. We can tell you goodbye, but I prefer to tell you so long! 1961. BERNARD JR. HIGH. UNION CITY, CA. COACH CARRABELLO MADE LISTENING TO GIANTS BROADCAST (TV/RADIO) MANDATORY IN P.E. WE HATED THE L.A. DODGERS. STILL LOVE THE GIANTS.. STILL HEAR LON SHOUTING ” THE GIANTS WIN THE PENNENT…THE GIANTS WIN THE PENNENT”, WITH EVERY BROADCAST. EVEN TODAY IN THE TOP OF UTAH. THANKS. My fondest memory of Lon was at a baseball game with my son, Brad White. Before the game Lon came walking down the first base line, hair glistening in the sun, and walked toward a crowd at the end of the dugout. Brad had a ball and wanted anyone to sign it so I told him to run down to get this guys autograph. When it was his turn Lon looked at him, and then up at me, standing about 10 rows up. Lon asked Brad if he knew who he was and Brad said no so Lon told him to run up and ask his dad. I told Brad it was Hank Greenwald so he rushed back down to Lon with his answer. Needless to say, Lon looked back up to me, shook his head and walked away. Brad never got his autograph but we enjoy a good laugh about it today. We enjoyed you immensely while you were with us Lon, you will be missed. We watched and listened whenever we could. In the spring and summer Mom’s transistor radio in the kitchen was permanently fixed on “the San Francisco Giants radio network” so she could listen to the play- by- play calls of, first, Russ “Bye- Bye Baby” Hodges and Lon Simmons, then, later, Al Michaels. Thanks to Mom and Dad, we even got in the car at least once a season and went to see our favorite teams in person. I remember watching John Brodie lead the 49ers in a losing effort against Fran Tarkenton and the Minnesota Vikings at Kezar Stadium. While I don’t remember getting to see a baseball game in Seal Stadium, I am fortunate enough to recall, as an impressionable kid, being awed in person by the Willies— Mays and McCovey— in sometimes sunny, usually frigid Candlestick Park. Even now I can close my eyes and find myself back in the car, Mark in the middle, David on his other side, the five of us filled with anticipation and excitement as Dad took the Paul Street exit off the 101 freeway south; it was special every single time. Nobody lived and died with the wins and losses more than my mom and my dad. Hers was an unconditional love, while he alternately loved and loathed his teams as they alternately exceeded his expectations then predictably broke his heart, many times in the same inning, possession, or game- winning drive or losing half inning. Dad and Mom were loyal and they taught us how to be fans. We were jubilant when the 49ers, Raiders, and A’s won rings; but sadly the team we all loved most, the San Francisco Giants, never ascended to the sport’s highest heights while Mom and Dad were able to listen on the radio or watch in the ballpark or on TV. In 2010, a ragtag group of seasoned veterans and journeymen joined a future MVP rookie catcher and the best young pitching staff in baseball and celebrated a world championship for the first time as a team with San Francisco on the uniform. To get there they beat the favored Philadelphia Phillies for the National League pennant on the second anniversary of my mother’s death. You can bet she and Dad watched every single minute. During the World Series victory parade in San Francisco, former Giants pitcher and current Giants broadcaster Mike Krukow addressed the crowd with a brief, but impassioned speech imploring the hundreds of thousands who were there to remember and honor the people in their lives who introduced them to Giants baseball. I sat in my living room watching and listening on my forty- six- inch HD television and thought of my mother and her transistor radio and my father, disappointed in the team one minute and delighted the next, and I cried like a baby. My father n backyard mowing lawn w “wee” transistor radio n breast pocket listening to Lon & Russ. No ear buds back then. RAISED 2 b a Giants fan! As a youth in the sixties, I didn’t have much, but I had a transistor radio. The Giants broadcasts with Russ Hodges, Lon Simmons, and Bill Thompson were what I looked forward to, nearly every day. My lifelong love of baseball was fueled by listening to these guys. My condolences to the Simmons family. How lucky you were to be a part of Lon’s life. Once Lon read a letter from a listener complaining that he was using the diminutive “Bobby” when referring to Bobby Bonds. The writer insinuated that it may have been racial. After reading the letter, Lon, with his dry wit, said he’d have called Bobby Bonds “Robert”, but “Robert” was his brother’s name. (Robert was a halfback on San Jose State’s football team). Lon Simmons’ voice introduced me to baseball. My grandmother in Maxwell, Calif., played every Giants game on the radio, which I would hear as a little kid whenever we visited my grandparents. The Giants themselves weren’t very good in those days, but Lon always made the games seem interesting and fun. I’m certain that’s why baseball in general, and the Giants in particular, have always held me in such a grip. Lon and Russ were my intro to baseball. My grandfather and I would sit in his big leather rocker and listen to Lon “tell it goodbye!” The Giants have been a part of my life ever since. I lived next door to them for a time. Went to high school with Cindy and Robin. Me and my Dad were at the first night game at Candlestick. My uncle who flew charter for United Airlines has some good stores about Lon. Wonderful memories listening to Lon on my transistor radio,hiding under the covers late at night. Giants fan since ’63 – I can’t begin to calculate how many hours I spent glued to my transistor radio listening to Russ and Lon calling the games. For my money, THE broadcasting team in the history of the game. Condolences to the family, and to all Old School Giants fans – his extended family. Our heart felt sympathy to the family-we too are related-our mother Betty Simmons and her brother Bill Simmons-they were first cousins I believe. We all have truly enjoyed his presence through the years. God Bless and keep the happy memories. He was blessed with love and great people. Great memories with my Dad listening to Lon Simmons announcing the Fresno games. Loved him way back then. RIP. My sympathy to the Simons family. Growing up in San Mateo, my family listened to SF Giants baseball. We would take a transistor radio to the games as everyone knew Lon and Russ’ broadcasts where the best coverage of the game. Listening to them yell, and it’s Bye Bye Baby when a home run was knocked out of the part is still in my head. His voice was like music to our ears and we knew there was a class act behind it. We are so fortunate to have experience Lon! The 60’s, sunshine, back porch, transistor radio and Lon, didn’t get any better than that! Happy Trails Lon. My husband, Stu Smith, worked as Lon’s producer and writer at KSFO and 49er football games many years ago. He was a dear friend of Stu’s and our family. My daughters Jyl Smith and Allison Marinec will miss him dearly. Our condolences to his dear daughters and brother. Favorite Lon TV call. A’s game against Angels. Player bent over in the on deck circle. Camera tight on the guy’s rear and Lon says “you probably can’t tell but that’s Brian Downing. And if you COULD tell, well you know him a lot better than I do.” I laughed for days. My Step Dad Bob Hill played for the San Francisco Seals knew and respected Lon. We listened to him while growing up and throughout most of my life. He was a great person. Lon Simmons provided the soundtrack to the summers of my youth. As great a baseball announcer as there ever has been and a very humble man. Always enjoyed listening to him doing Giants’ broadcasts but probably even better doing Niner games on the radio. His call of the Montana-t-Taylor game winning TD in the Super Bowl is one of my favorite game memories. He really will be missed. Tell it goodbye , Lon. Growing up listening to Lon on the radio, was something I enjoyed there would be times at home the foot would have the tv on and turn on the radio and we would listen to him announce. Also, growing up playing the great game of baseball, I know I’m not the only one who would play in their backyard or with friends but I would also try to announce play by play just like him. Pretending it’s bottom ninth bases loaded and we have a one run lead and he’s announcing the game as we played ball. He is the cornerstone to the monument of my love for Giants baseball and baseball in general. But specifically Giants. My condolences to his family going through this painful time, we have lost one of the greats, rest in peace Mr Lon Simmons. Go Giants! While growing up, Giants baseball wasn’t baseball unless you were announcing the game. As a child, I would sit in the bleachers, at the ‘stick, with my grandfather, watching Mays & McCovey, listening to you call the game on the radio. Giants ball & Lon Simmons, are in the top 5 of my favorite childhood memories. ‘Til we meet in that great ballpark in the heavens, thank you & rest well. Used to hear him every game with my grandpa on the radio.